Jesus the Christ who was born in the flesh once for all of us, desires to be born again in the spirit in those who desire Him. In each of us, he again becomes a child in the womb of our soul and forms himself from the virtues. He reveals as much of Himself as He knows each of us can accept. Let us contemplate the mystery of the incarnation and in simplicity praise Him who became man for us. Saint Maximus the Confessor (quoted in the Philokalia). This extended passage about a prayer from the Apostolic Tradition of Hippolytus (“a little book with prayers for the Eucharist, baptism, ordination, and other rites reflecting practice in Rome at the end of the second century”) is again from Wilken’s The Spirit of Early Christian Thought: Seeking the Face of God (32-36). Although Wilken defends a Catholic conception of Christ’s re-sacrifice that I do not espouse, there is great value in his overarching insight that God’s redemptive acts, recorded in scripture and remembered in the sacraments, are a true and present reality to us. Although it is a prayer of adoration, thanksgiving, and supplication, it has a distinct narrative structure. …[This imitates] the psalmists [who] do not simply praise the majesty and goodness and power of God, they identify God by his actions, “his mighty deeds.” To praise God is to narrate what he has done. There are parallels between this sense of remembrance and the way the Exodus out of Egypt is remembered in the Jewish Passover. In the Mishnah, the collection of Jewish law from the early third century, it is reported that Rabbi Gamaliel used to say, …”In every generation a man must so regard himself as if he came forth himself out of Egypt, for it is written, ‘And you shall tell your son on that day saying, “It is because of that which the Lord did for me when I came forth out of Egypt.”‘” Those who celebrate Pesach are not spectators, they are participants. “It is I who came forth out of Egypt,” says Rabbi Gamaliel. Remembrance is more than mental recall, and in the Eucharist the life-giving events of Christ’s death and Resurrection escape the restrictions of time and become what the early church called mysteries, ritual actions by which Christ’s saving work is re-presented under the veil of the consecrated bread and wine. Speaking of the Christian paschal celebration Origen wrote, “The Passover still takes place today” and “Those who sacrifice Christ come out of Egypt, cross the Red Sea, and see Pharaoh engulfed.” What was once accomplished in Palestine is now made present in the action of the liturgy, as the prayers indicate: “We offer to You 0 Lord, this awesome and unbloody sacrifice, beseeching You to deal with us not according to our sins.”” Liturgy is always in the present tense. The past becomes a present presence that opens a new future. …The repeated celebration of the liturgy worked powerfully on the imagination of early Christian thinkers. It brought them into intimate relation with the mystery of the Christ, not as a historical memory, but as an indisputable and incontrovertible fact of experience. Leo the Great, bishop of Rome in the fifth century, put it this way: “Everything that the Son of God did and taught for the reconciliation of the world, we know not only as an historical account of things now past, but we also experience them in the power of the works that are present.” Before there were treatises on the Trinity, before there were learned commentaries on the Bible, before there were disputes about the teaching on grace, or essays on the moral life, there was awe and adoration before the exalted Son of God alive and present in the church’s offering of the Eucharist. This truth preceded every effort to understand and nourished every attempt to express in words and concepts what Christians believed. Another one of “the most distinctive features of Christian intellectual life” is the influence of God’s word. However, Wilken stresses that the scriptures provided far more than an intellectual basis for the early church. 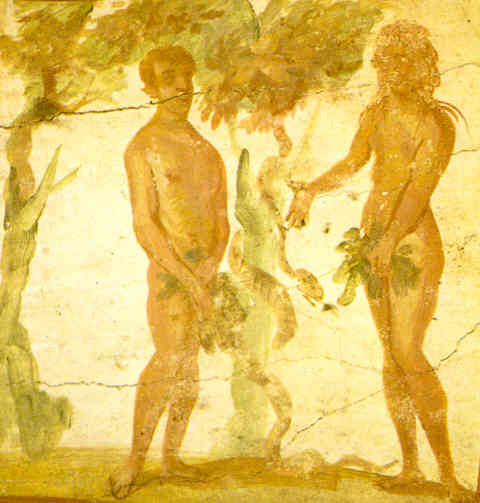 Fresco of Adam and Eve in the catacombs of Saints Marcellinus and Peter (Rome, A.D. 300-350). My wife and I got a Kindle for Christmas form her family and often find ourselves reaching for it at the same time. One book that I particularly enjoyed reading recently was Robert Louis Wilken’s The Spirit of Early Christian Thought: Seeking the Face of God. I’ve cited it once already and will post several more passages as I go back through the long page of highlights that I generated. Here’s a short one from midway that touches upon many of the others. Early Protestants (from the first generation of Reformers through the America Puritans of the colonial period at least) had a wide-spread, intimate and appreciative knowledge of the church fathers. This basic conservative (and biblical) instinct is something that we easily loose sight of in a fast-paced and entertainment-driven age. We survive and mature by receiving from our fathers (with thankful hearts) all that we can bear. Protestants need not feel threatened by this. More worthwhile still might be to ask whether or not this really is among “the most distinctive features of Christian intellectual life.” What other contenders are there, and do they conflict? Wilken raises several others himself in the course of his own efforts to conjure the thought life of early Christians. I need to read Gregory the Great and Maximus the Confessor directly, but these passages from Robert Louis Wilken’s study of Early Christian Thought illuminated human nature for me in some fresh, clear and simple ways. Yesterday’s post reminded me of these passages.